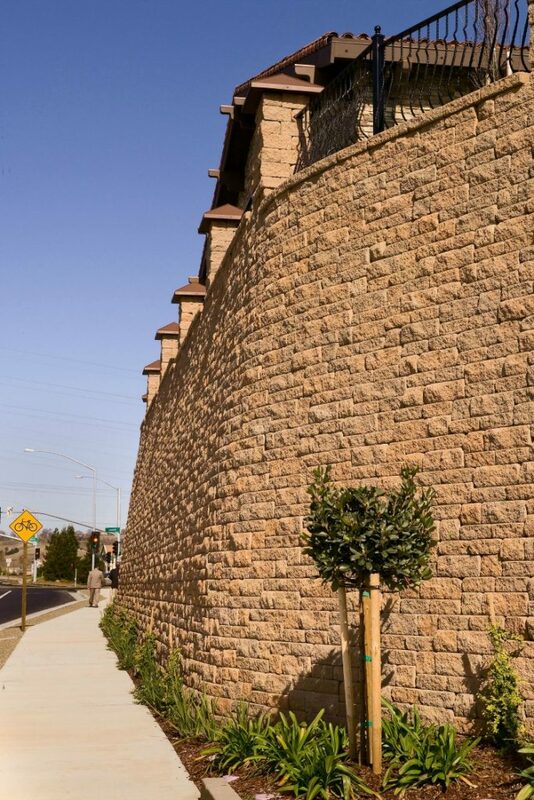 The following excerpt is a continuation in our series looking at the history of Segmental Retaining Walls (SRWs). For the full article, click here. 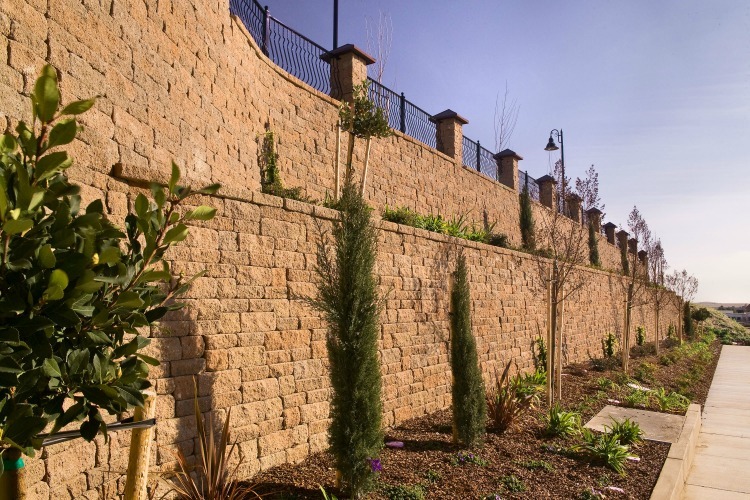 Segmental retaining walls (SRWs) are used in both private and public development projects. 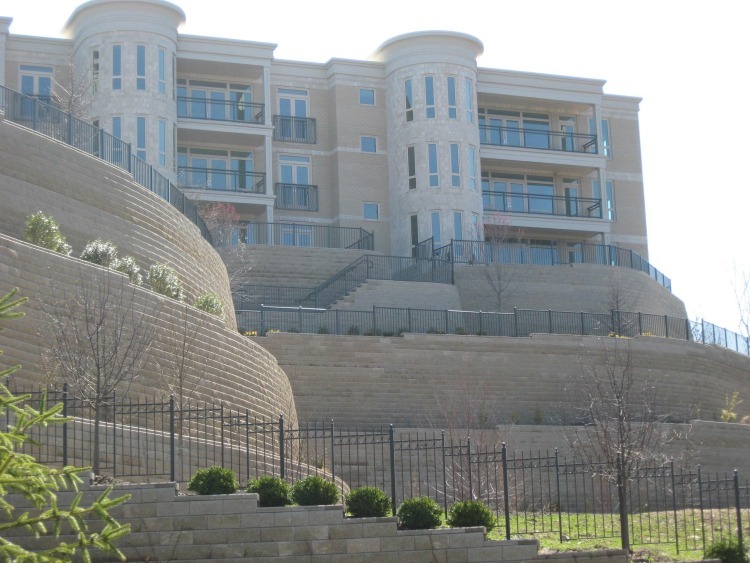 SRWs utilized in the private market are generally designed in accordance with the NCMA design specifications and the design methodology presented in the NCMA Design Manual for Segmental Retaining Walls. In the transportation market the design specifications follow the AASHTO LRFD Bridge Design Specifications published by the American Association of State Highway Officials for the local state transportation markets. 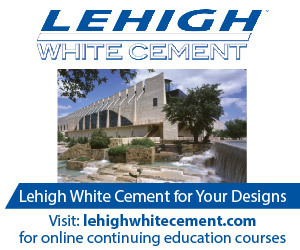 Cities and counties may adopt either the State specifications (AASHTO) or the commercial specifications (NCMA). While the specifications, design methodologies and material requirements have some similarities the two markets have their differences. 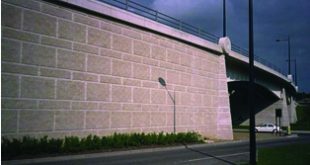 Transportation markets are accustomed to wetcast concrete products and steel reinforced soils and have consequently developed their requirements around these products (e.g. concrete leveling pad, non-corrosive backfills). Another difference is the design and construction specifications, particularly the gradations of the aggregate fill materials. This article summarizes some of the differences of each system. The NCMA design methodology is based around the Coulomb earth pressure design. Earth pressures are based on a homogeneous, infinite soil mass in a state of plastic equilibrium. The soil mass has a frictional component (ϕ), a cohesion (c) and a unit weight (γ). Coulomb’s method assumes there is wall friction (δ) between the soil mass and the back of the retaining wall, in this case, the back of the SRW units, as well as a wall facing inclination from vertical known as a wall batter. Both wall friction and wall batter reduce the amount of earth pressure acting on the wall. In taller walls, where the mass of the SRW units is not sufficient to resist the earth pressures, soil reinforcement is used to reinforce the soil mass, forming a mechanically stabilized earth (MSE) structure. The SRW units in an MSE design provide a form to retain the soils and a facing to the soil mass. In the current design methods, there is very little structural capacity attributed to the facing. Connection between the geogrids and the SRW facing can be frictional (normal load dependent) or mechanical. From laboratory testing of the SRW units and geogrids, a connection and shear curves are developed for use in design. Pullout capacity of the reinforcement is also determined from laboratory testing of the geogrid reinforcement and typical soil types. A factor of safety of 1.5 is used in calculating the required length of the reinforcement beyond the Coulomb failure plane. NCMA recommends a minimum of one foot (approx. 300 mm) of the soil reinforcement be embedded beyond the theoretical failure plane. NCMA recommends an allowable stress design (ASD) methodology, when calculating the driving forces and moments, the resisting forces and moments, and designs to a minimum factor of safety of resisting forces / driving forces. The design methods used in the transportation market have changed over the years. In 2007, a Load and Resistance Factor Design (LRFD) method was adopted. In LRFD, “load factors” are applied to the driving forces and moments and “resistance factors” are applied to the resisting forces. The results from allowable stress design (ASD) and current LRFD design are very similar. For example, ASD design uses a factor of safety of 1.5 on the resisting forces for tension divided by the driving forces. In LRFD design, a load factor of γEV of 1.35 is applied on the calculated earth pressure and a resistance factor (RF) of 0.9 is applied in the calculation. The equivalent factor of safety would be 1.35/0.9 = 1.5, the same as an ASD design. In ASD and in seismic design, the load factors again are set to 1.0. AASHTO continuous to work to calibrate the load factors to better meet the design requirements, so factors may change with each update to the AASHTO bridge manual. AASHTO uses a Rankine earth pressure approach to calculate the internal earth pressures when the wall batter is less than 10 degrees. The top surface is assumed to be level with any slope modeled as an equivalent earth surcharge load. Therefore, with this assumption, the wall friction angle (δ) is equal to the slope angle (β), which is zero degrees, and the wall batter is assumed to be vertical. For wall batters greater than 10 degrees, the Coulomb approach is used in AASHTO; however, most transportation walls are near vertical or less than eight degrees in wall batter. The resulting Rankine earth pressure is a little more than the Coulomb approach NCMA utilizes. For calculating the geogrid connection strength, AASHTO has a more conservative approach than NCMA, which takes into account the ratio of the ultimate tension (Tult) of the geogrid (published: Minimum Average Roll Value (MARV)) divided by the lot strength (Tlot), strength of any individual lot, and includes a factor for long-term connection strength of the connection (CRcr). 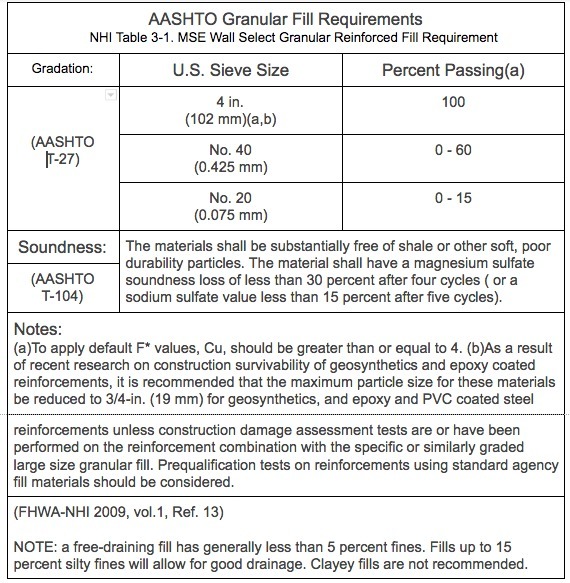 AASHTO also includes a resistance factor of 0.9 for pullout of the geogrid from the facing elements. For those systems that actively participate in the transportation market and that have completed the long-term testing, the range of values appears to be between 1.0 and 1.3 for frictional systems and equal to the geogrid creep reduction factor for mechanically connected systems. An area having the most differences is in the project specifications. 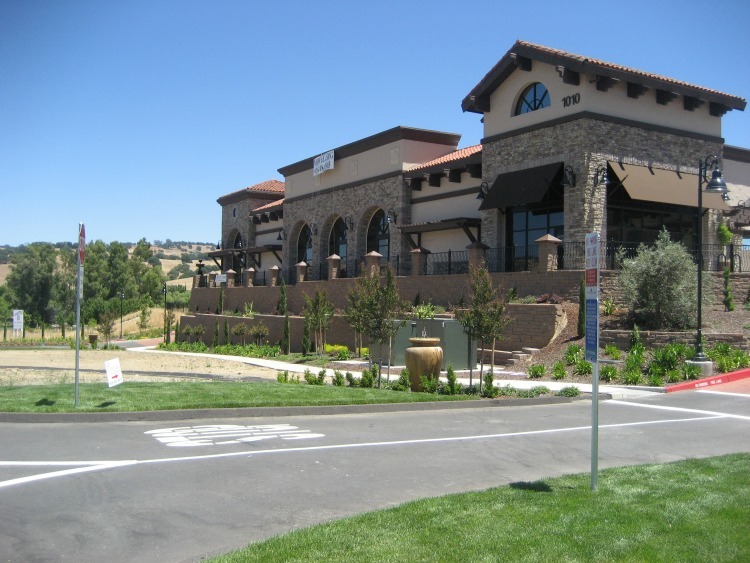 NCMA designs were established for commercial and residential projects providing safe, economic designs. 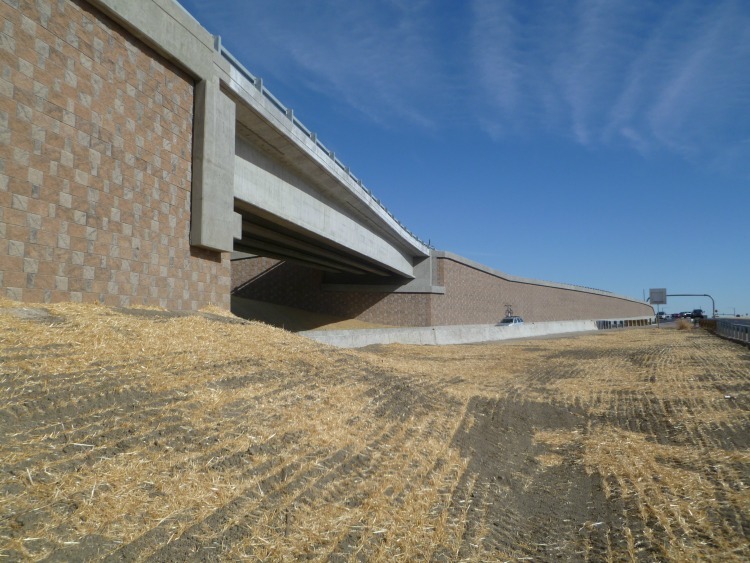 AASHTO specifications are written for transportation structures following the established requirements for panel/steel reinforced mechanically stabilized earth (MSE) walls. Designs using geosynthetic reinforcements do not require non-corrosive backfills, so using granular on-site soils is generally preferred. Commercial projects follow ASTM C1372 which specifies a minimum concrete compressive strength of 3,000 psi for normal weight aggregates. AASHTO is more conservative requiring minimum concrete strengths of 4,000 psi (27.5 MPa). The transportation market is subjected to use of deicing chemicals on roads, bridges and walkways. Deicing chemicals (calcium chloride, sodium chloride, potassium chloride, or magnesium chloride) are very aggressive and can be damaging to concrete; the salts may cause scaling and breakdown of the concrete. This damage applies to SRWs as well as cast-in-place walls that are subject to road spray during winter months. Many transportation specifications may require higher compressive strengths for better durability and a more stringent requirement than ASTM C1372. For example, some State Department of Transportation specifications require less than 1% of weight loss after 40 cycles of repeated freezing and thawing in a 3% saline solution for freeze thaw durability. Commercial projects recommend construction inspection as the SRWs are constructed, however this may not be a requirement, and if that is the case, construction inspection can be neglected. Residential walls may or may not be professionally designed and often do not have on-site testing included with the construction specifications. The lack of construction inspection in the field can result in poor quality construction and could result in performance issues in the walls. Transportation markets generally have full-time site inspection in place for all projects. The testing frequency and acceptance criteria are set in the construction specifications. The fill soils are generally imported and checked regularly for gradation and plasticity. The contractors for transportation projects are usually well-qualified and most likely have constructed several similar projects. In these cases, the quality assurance on the site is typically good and walls perform as intended. In summary, the commercial markets versus the transportation markets is simple. The designs are fairly similar regarding the amount of reinforcing and the facing areas required. The transportation markets are more conservative on material selection and specify higher concrete compressive strengths for the SRW units. Depending on the state conditions, transportation project may often require freeze-thaw testing in water or saline solutions in areas of repeated freezing and thawing. Commercial markets often do not specify freeze-thaw testing but when they do, a water solution is used instead of the more aggressive saline tests. Finally, a commercial project may or may not have on-site inspection where the transportation markets generally require it. As this article demonstrates, the designs for commercial and transportation systems are similar. Transportation markets are more conservative requiring full-time inspection during construction and the use of high quality fills for the reinforced zone. Both of these design and construction items have significant impacts on the long-term performance of the wall work. If everything is properly considered in design and properly constructed, both wall systems will perform well.